Recently, it was announced that we’d been selected as one of America’s Best Companies for Customer Service by Newsweek in 2019. Not only that, we are the #1 Brand in the Handyman Referral Service and Home Repair category. First, we have a meaningful and authentic focus on our customers. We know you have a choice and we know your home is extremely important to you. Because of this, we developed and implemented a Customer Experience Program inside our company called Service Path. We designed this program to ensure that we consistently treat you as an individual and treat you beyond your expectations at every point of the Customer Journey. Second, we possess a TEAM of employees that are aligned with our culture of values & ethics and share in the insatiable desire to do the right thing at all times. We all believe in our mantra of helping you love your home and is shown by our Guarantee and our “Like it’s our Home Promise”. Simply put, We Are Different! Third, our goal is to earn your Trust and become your Home Ally. This cannot be accomplished by only focusing on making repairs or updating a bathroom. It also involves your experience with Handyman Matters from the moment you contact us to the moment our Craftsman is leaving your home after completing a job. Throughout that time, we ensure we communicate along the way and even send “On My Way” Text Notifications so you know when we are on our way. Sometimes it’s the small things that really count! Rest assured that we do not take earning this distinction lightly. Additionally, rest assured that we are not done with continually improving the Customer Experience we will provide our customers day in and day out. Thank you for choosing Handyman Matters and for helping us to earn the distinction as one of America’s Best Companies for Customer Service. See the results here. Handyman Matters Franchising has been selected for the 2017 Lakewood Small Business Excellence Award in the Contractors classification by the Lakewood Small Business Excellence Award Program. Various sources of information were gathered and analyzed to choose the winners in each category. The 2017 Lakewood Small Business Excellence Award Program focuses on quality, not quantity. Winners are determined based on the information gathered both internally by the Lakewood Small Business Excellence Award Program and data provided by third parties. The Lakewood Small Business Excellence Awards recognizes outstanding small businesses that serve the Lakewood area. Each year, our selection committee identifies businesses that we believe have achieved outstanding marketing success in their local community and business classification. Recognition is given to those companies that have shown the ability to use their best practices and implemented programs to generate competitive advantages and long-term value. These are small businesses that enhance the positive image of small business through service to their customers and our community. These exceptional companies help make the Lakewood area a vibrant and vital place to live. The Lakewood Small Business Excellence Awards was established to reward the best of small businesses in Lakewood. Our organization works exclusively with local business owners, trade groups, professional associations and other business advertising and marketing groups. Our mission is to award the small business community’s contributions to the U.S. economy. It was twenty years ago that Andy Bell made the decision to leave the restaurant industry and to begin a home repair and remodel business in Denver, Colorado. Initially it was simply with the intent of creating a business for himself as he and his wife raised their family. But the initial response and the positive feedback from customers proved to be so immediate and so overwhelming that it was clear there was a market for the kind of unique and customer-friendly services his company—initially called Handyman Express—was offering. Opening a second office in the north Denver/Boulder area proved that the idea was not a fluke. Customers responded to the idea of a home repair business that was consistently reliable and manned by craftsmen who were professional in appearance and demeanor, and it became clear that this was a concept that could be embraced in all markets, and in 2001, Bell began franchising his services. Two decades later, the company, known since 2001 as Handyman Matters (HMM), has consistently been recognized by Entrepreneur Magazine as a top franchise. When the economic recession hit in 2008, businesses of all types and sizes took a significant hit, none more so than those in the home repair and remodeling field. 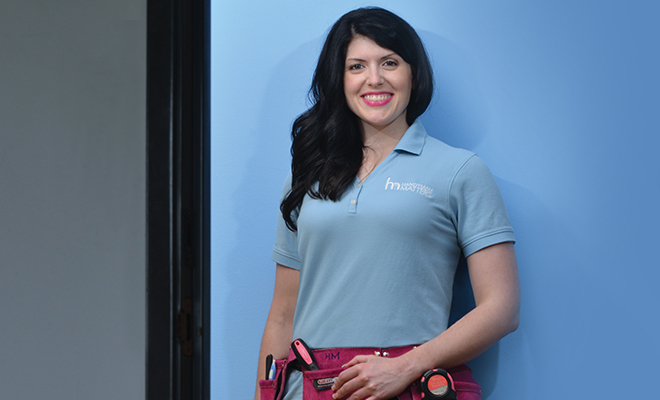 There were thirteen recognized home repair franchises in 2008; Handyman Matters was one of the few still standing in 2013, and it has consistently been regarded as a leader in the industry since its inception. Bell attributes this to the core values he established when he opened that first office in 1998; they are the same values that guide the company to this day and which regularly draw new owners to the concept. HMM just opened a franchise in Fairbanks, Alaska, making the company a presence in 24 states. Handyman Matters is here to help you love your home and with that comes protecting our customers and their homes. Fraud is a big deal in the home improvement industry. In fact, the Federal Trade Commission estimates that Americans lost more than $4.1 billion to fraud and scams in the last 5 years alone. Those numbers are terrifying for any homeowner. The home improvement industry is a $200 billion industry each year and poor workmanship is the number one fear that homeowners have when hiring a contractor. We have put together some tips to help you make an informed decision the next time you’re looking to hire a contractor for home improvements. Check out any online reviews to ensure other customers have had good experiences. One can learn a lot from reviews, as well as how a company responds to reviews, good or bad! It is also a good idea to take a look at the Better Business Bureau for any reviews and to make sure the company is in good standing. Always get a written and signed quote for the job no matter how big or small it is. Collaborate directly with contractor for any possible change orders if it becomes necessary. If you are dealing with an insurance claim, check with your insurance company to see if an inspection needs to be done prior to the start of the project. Pay for the job with a credit card or check and get a receipt. Never pay in cash. Do not pay for the job up front. Ask to be billed after it’s completed. Or if it’s a deposit for a larger job, just ensure to get a receipt. It is important to research a contractor or company before having them work on your home. Handyman Matters can do it all, and we can back it up. We are trusted, licensed and guaranteed. Consumers can now choose from available time slots and book 24/7! Handyman Matters’ recently launched website features cutting-edge technology that allows consumers to book their own appointment times with a local office. Designed to increase the convenience of booking an appointment, consumers simply provide details on the project need, estimate the number of hours needed, choose from available times and submit. Handyman Matters offices receive this data live in their calendars and confirm. Check out the website at: www.HandymanMatters.com. Committed to helping you love your home, Handyman Matters’ locally owned and operated offices provide professional and multi-skilled craftsmen, trained to handle a homeowners’ to-do list or that larger, more critical project like a bathroom refresh or remodel. The unique offering that is the best option for most consumers is the Half Day Package or Full Day Package, which can easily be booked online. Simply, the consumer receives four or eight hours of professional craftsman time, to be used to get projects, touch-ups or that nagging to-do list completed. Image via The Purple Heart Foundation. In recognition of Veteran’s Day, let’s join together to honor those who have served our country in the U.S. Armed Forces. We have selected The Purple Heart Foundation to support this Veteran’s Day. Although The Order of the Purple Heart membership is composed of military men and women who received the Purple Heart Medal for wounds suffered in combat, the Organization supports all Veterans and their families with an extensive range of nation-wide programs. To name a few, these programs help Veterans recover from combat injuries, they help them with employment and education, they sponsor youth programs focused on fostering patriotism, they offer scholarships and work with schools to promote the learning of U.S. history and the quest for freedom. In short, the Purple Heart Organization helps our Veterans make the transition from the battlefield to the home front. Click Here to learn more about the Purple Heart Organization. Handyman Matters is extremely proud to say that Veterans own and operate nearly 20% of our locations across the U.S.. Supporting Veteran-focused non-profits like The Purple Heart Foundation is very important to us, and we encourage you to take some time this Veteran’s Day and honor the Vets in your life as well. There are many ways to help, and your generosity makes a difference in the lives of the men and women who have selflessly served our country to preserve our freedom. Click Here to learn about the various ways you can support this outstanding organization. Have any burning home repair or maintenance questions that weren’t answered on this episode of The Troubleshooter? Give us a call – 866-FIX-MY-HOME! I love working with my hands and always have a project going. Whether it was working on my rental properties, my own house, or helping my friends, I was always investing in a fixer-upper or building something. I decided to combine the two by owning and operating my own construction company.